A unique ecology project shows that tourism doesn’t have to mean condominiums and car parks. The horses of Lake Pape are rejuvenating a beautiful landscape in their own elegant style. What a difference a border can make. While Lithuania’s Baltic seafront is a warren of villas and sanatoriums, the adjacent bit of Latvia appears to be a century or three behind. The two lane road winds through a silent landscape of marshes and occasional farmhouses. Stop off in one of the seaside villages and you’ll be hard pressed to find a single cafe, but you are almost guaranteed to have the crashing of the waves and the squawks of the seagulls to yourself. The contrast is due to the fact that the Lithuanians intensively use their very short coastline for summer fun, while the strip south of Liepaja is a backwater far from Latvia’s main population centers. With EU membership rendering the frontier meaningless – there are reports that the southerners are already snapping up beachfront property north of the line – the development gap is sure to even out over the next few years. But for now, southwestern Latvia must be one of the most unspoiled maritime regions in Europe. However, that doesn’t mean that it has been left to grow over. In fact, the area is the venue for some cutting edge environmental schemes that are bringing benefits to all involved parties – local people, visitors, animals and the land itself. 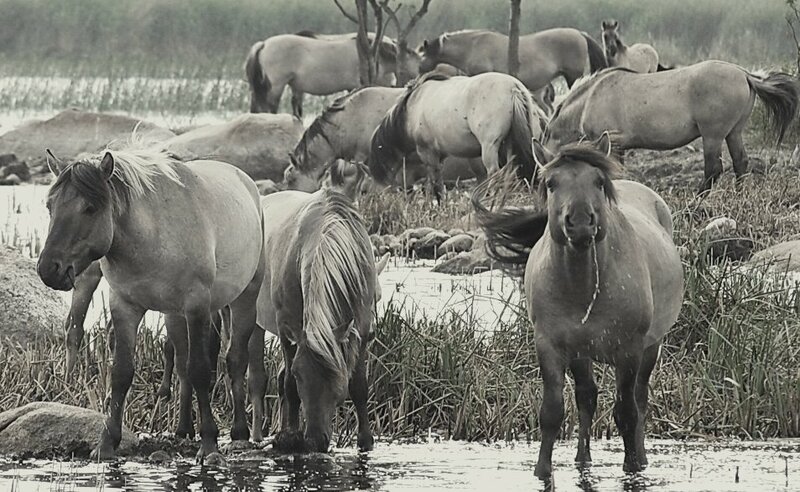 One of the best examples is a 240-hectare sanctuary for wild horses near Lake Pape (Papes ezers), a truly remote, windswept place that is home to around 40 tarpans, undomesticated grey animals with distinctive black stripes. Animal lovers will enjoy seeing these attractive beasts, and they are also interesting from a scientific viewpoint. Local folk songs attest that wild horses used to roam over this landscape, as indeed they did across the continent. However, a mixture of farmers slaughtering them to protect their fields, and domestication, saw them completely disappear by the 1700s. But in the 19th century scientists began selective breeding to try and restore the wild strains, and a herd was established in Poland. Latvia entered the picture in the late 1990s when the local branch of the World Wildlife Fund joined a program to spread the species out from a breeding center in the Netherlands. The WWF bought the Pape property, former collective farm grazing pastures, and the first 18 horses were released in 2000. They have successfully bred, and the project has worked by other measures too. By eating away scrub, the animals have rejuvenated the land to the extent that large numbers of birds are nesting there again. They get on well with 23 wild cows released into the area in spring 2004 as part of a similar experiment. 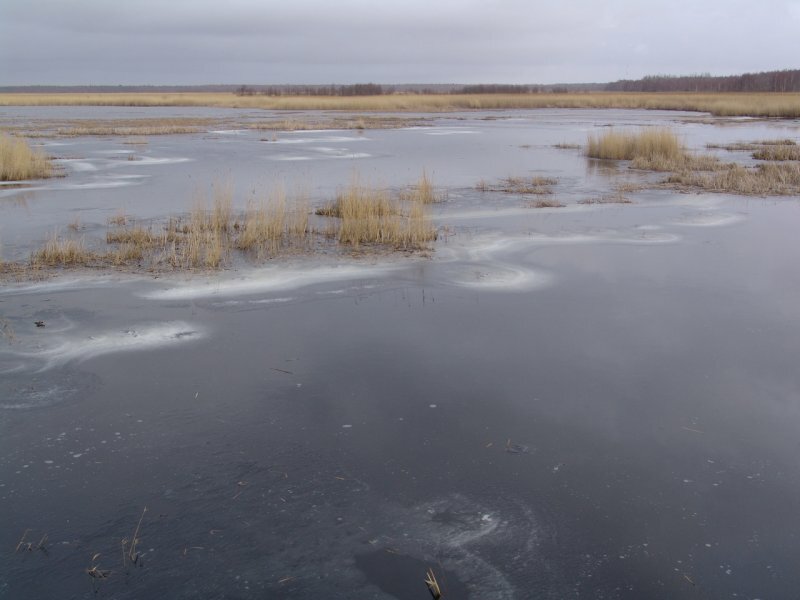 As an extension of the program, 15 horses have been taken from Lake Pape and released at two other locations in Latvia. The horses live under a complex hierarchical structure under dominant males, and as their population has grown, they have divided into two “harems” to prevent in-breeding. There is a constant tension between the animals’ instincts to remain wild and to domesticate. They can smell things up to 1 km away and will run for 24 hours non-stop if frightened, but in a relatively short time they have grown used to having humans a short distance away (you can get to within about 10 meters, but any closer would be unsafe). Riding them would involve a longer process, though – the sanctuary guides say that if a foal saw attempts to break in its mother, it just might be amenable to getting saddled up itself. Perhaps that is the attraction of what is going on in this unique area – humans and nature adjusting to each other naturally rather than having the matter decided by bulldozers.